Chiaroscuro is the practice of bringing the color behind a figure or object across its edges and into the shaded side of that object. This can greatly heighten the illusion that the object exists in 3 dimensional space, and it works equally well for painters, draftsmen, and digital illustrators. This image is by Caravaggio, the Italian painter credited with popularizing the technique. Notice how the right side of the figure’s face disappears into the dark background, and that the edge of the dark side ceases to exist in many places. The effect is more pronounced in the hand that holds the sword. Only his thumb and two fingers emerge from the background. The viewer is left to imagine things that are only suggested in the painting. In this case chiaroscuro has put the figure’s nose and brow into sharp relief and increased the sense of 3D sculpted volume in the head. These two hockey pucks were created in Illustrator. The one on the right uses simple flat objects for the red oval surface of the puck and the cast shadow. The one on the left changes these to gradient fills with matching color elements, and takes advantage of chiaroscuro. This detail is from Singer Sargent's The Daughters of Edward Boit. Notice that the edge of the girls’ hair in the background only exists in a couple of small highlighted curls. Your own eye fills in the rest. You can’t really see anything of the left edge of the big vase, but you have no doubt about its reality. Look at how the dark shaded color from the next room flows right down into the hair of the child in the lower right, establishing her special relationship with the rest of the painting. The shading on the figure to the left is done in the same color as the wall behind her, so that the edge of her apron vanishes into the wall’s surface, and her shaded arm mirrors the color of the wall’s beveled edge. Look at the shadows cast by her shoes. You can't tell where the shoe stops and the shadow begins. 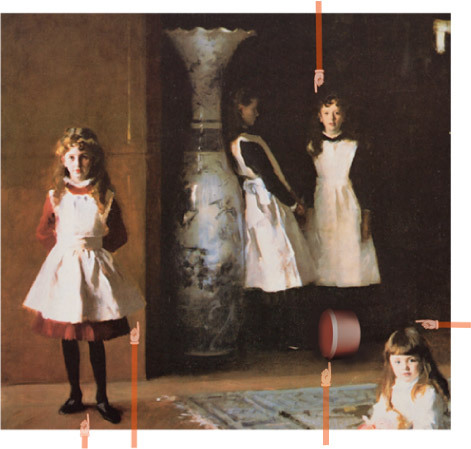 The hat box that the girl in back is about to kick in the direction of her baby sister was created in Illustrator to match the perspective of the painting, and then added to the image in PhotoShop. The airbrush tool (on a couple of layers with adjusted opacity) is used to produce the shadows and blending that mimic the chiaroscuro in the painting. Remember that you don’t have to have a dark background to use chiaroscuro. 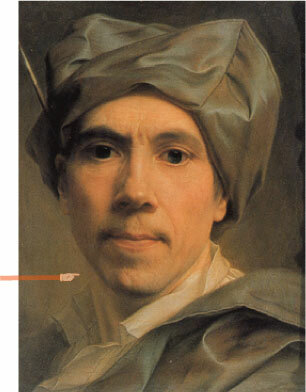 In this self-portrait by Christian Seybold the left side of the background is lighter than the figure’s white collar. 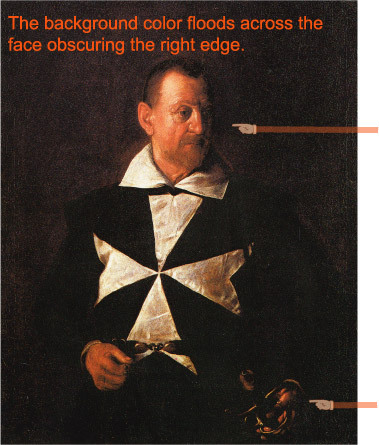 In this instance, the painter brings the background color across into the highlights (near the chin) to produce the same effect.